The United States Congress designated the Comanche Peak Wilderness (map) in 1980 and it now has a total of 68,025 acres. All of this wilderness is located in Colorado and is managed by the Forest Service. The Comanche Peak Wilderness is bordered by the Neota Wilderness to the west and the Rocky Mountain National Park Wilderness to the south. The 70 miles of trails that wind through this Wilderness begin flanked in ponderosa pine and aspen, and then pass through a thick forest of lodgepole and limber pine. From the trails, the Wilderness appears to be nothing but trees until the forest gives way to abundant alpine tundra along the southern boundary near Comanche Peak. Beyond Comanche to the south, lies Rocky Mountain National Park. The Cache la Poudre River tumbles over cascades or runs quietly in pools for over 10 miles to the north and west. The rugged Mummy Range (of which Comanche Peak is a part), combined with the river, forms one of the state's most serpentine Wilderness boundaries. The Big South Fork of the Cache la Poudre River is largely responsible for draining Comanche Peak, and it joins forces with the Little South Fork to form Colorado's only Wild and Scenic River drainage. This Wilderness receives heavy human use. 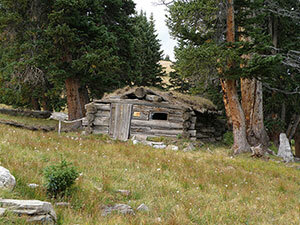 Planning to Visit the Comanche Peak Wilderness? How to follow the seven standard Leave No Trace principles differs in different parts of the country (desert vs. Rocky Mountains). Click on any of the principles listed below to learn more about how they apply in the Comanche Peak Wilderness.